The developers told me they are roughly half-way through development and they are aiming for a late 2017 release for the game. Gone are the RPG clichés of potions, wars between elemental gods, and plots about youngsters who accidentally stumble upon a magic power that allows them to save the world. 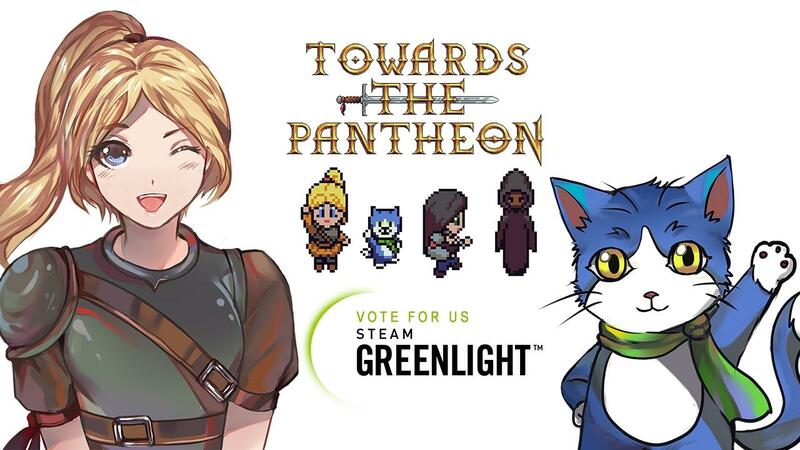 Instead Towards The Pantheon is a unique and unusual game that follows Freyja the warrior, Bam the cat, Mishima the cyborg, and Phenez the ghost on their simultaneously lighthearted, fun, dark, and painful adventure. Whether it be silent protagonist Freyja searching for self confidence to overcome her mutism, Bam wishing he was back home with his stash of catnip, Mishima’s conflict over whether she must replace her heart with a computer chip in order to fit into her cyberpunk society, or Phenez’ dark struggle for redemption, Towards The Pantheon deals with personal and philosophical topics that all players can relate to. I think it looks pretty cute and it's good to see more high quality looking 2D RPGs coming to Linux. Am I the first to comment ?